Beginning Funk Bass features Abe Laboriel, one of today's most talented session players and a Berklee College of Music graduate. Abe has performed with many popular musicians, including Herb Albert, Lee Ritenour, Al Jarreau, George Benson, and Quincy Jones, to name just a few. On this DVD, Abe presents 40 minutes of solid funk bass. He demonstrates thumping, slapping, snapping, and popping. This DVD is not just for the beginner; in addition to the basics, Abe offers real insights into his own style and technique. He performs right-hand technique, funk rhythm, playing with a drummer, pentatonic scales, triads, and more. 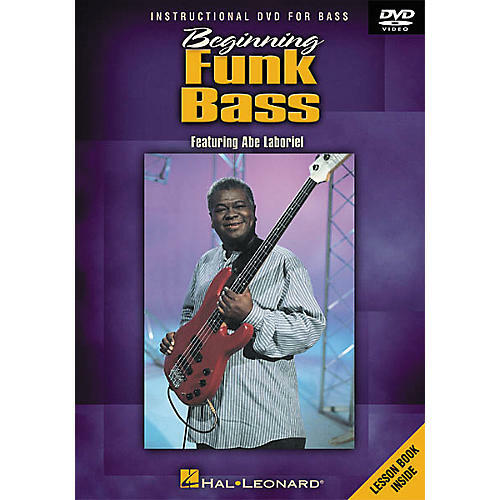 This insightful DVD presents an essential foundation needed by every funk bass player. Includes a lesson book. 40 minutes.